Ahh…Spring Cleaning! Time to open the windows, break out the cleaning tools and get ready to tackle your home! These 7 Cleaning Tools will make your life easier! Spring cleaning, and really cleaning in general are typically not on the top of the list when it comes to enjoyment. Although I do enjoy cleaning, I rather be taking a walk, or reading a book, or spending time with the family. 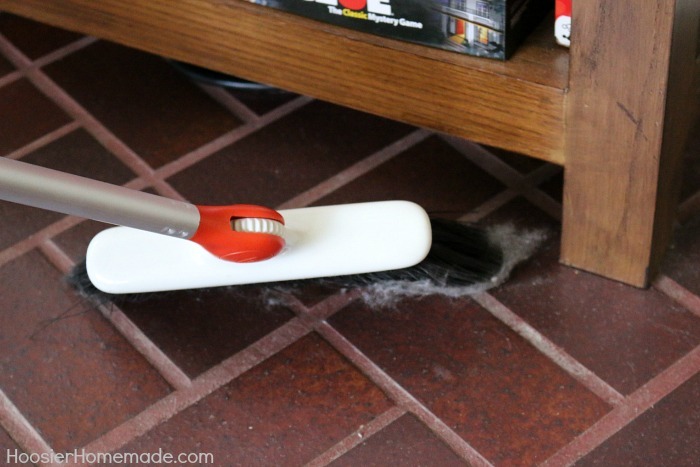 So anytime I have a chance to use a cleaning tool that will make my life easier, it’s a win-win for everyone. I have shared with you before my love for OXO products. The Strawberry Huller is the best tool I have in my kitchen – well besides Mabel, my stand mixer. Their products are durable, last a life time and the unique design help you perform your task easily, quicker and more efficiently. I don’t know about you, but any time I can get my work done better, in less time and with ease – I’m a happy homemaker! First up in our team of 7 cleaning tools is the Any Angle Broom. Our youngest son cleans the house for us once a week, and although I’m very grateful for his help, he doesn’t always get in the nooks and tight places like I would. 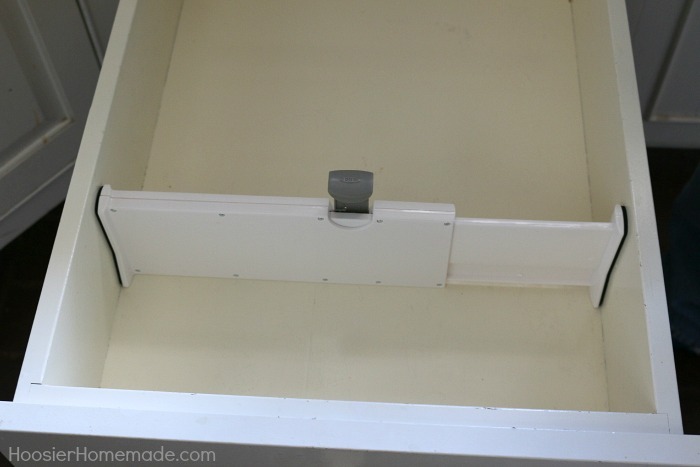 The OXO Any Angle Broom is designed to fit into tight spaces and corners from any angle. The head of the broom clicks into place and makes quick work of those hard to get to places like under our entertainment center. Cleaning up messes aren’t just inside, our front porch area needed some attention too. 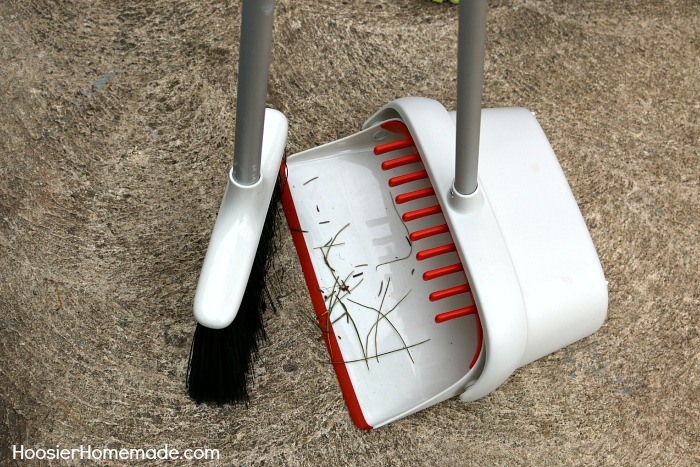 The OXO Extendable Sweep Set made quick work of the messy steps. It has a full size broom head with extendable pole. And see those orange finger like bristles? They make quick work of the mess that sticks to the broom head. 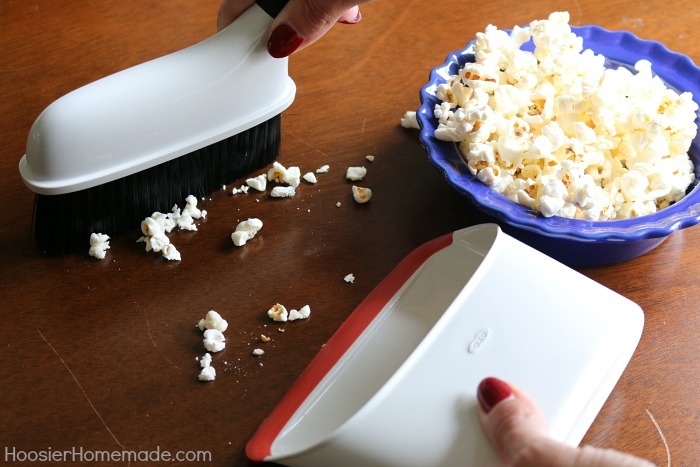 And speaking of entertainment, we love movies and popcorn, but it can be messy. 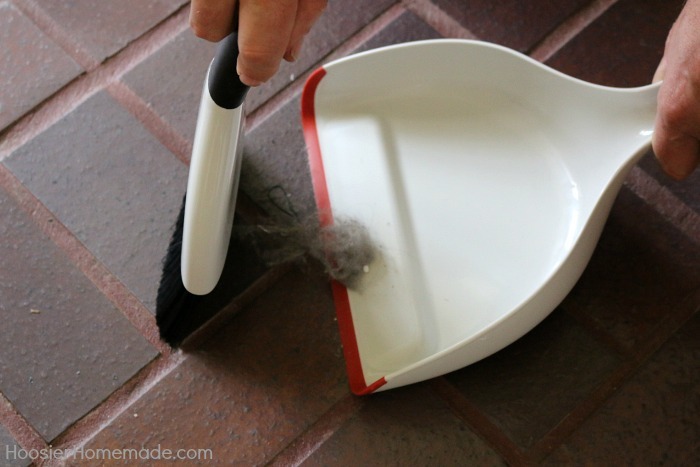 The OXO Compact Dustpan and Brush with it’s flexible lip make quick work of any little mess. I’m keeping this little tool in the studio. 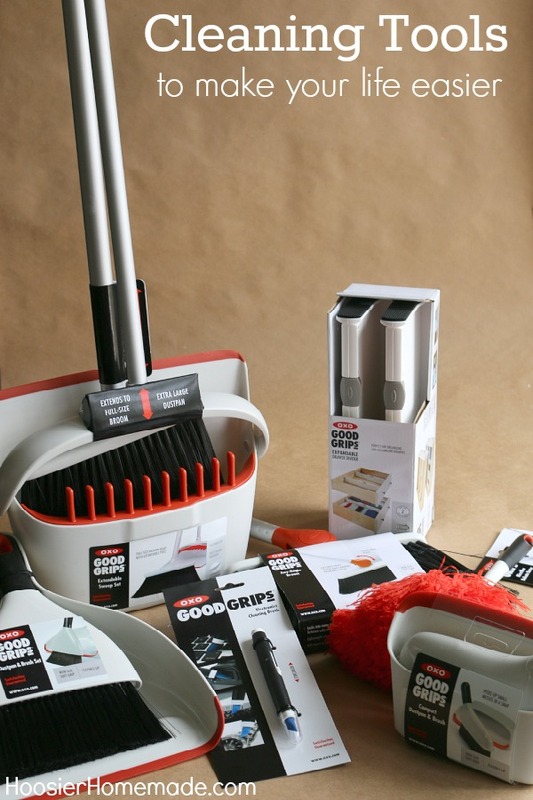 And for jobs that are a little larger, the OXO Dustpan and Brush Set are perfect! I hate when you go to pick up the dirt that you just swept up, push it into the dustpan, and it flies under the dustpan. The flexible lip on the dustpan takes care of that issue. During the Winter months when the furnace is on, the dust gets out of control. Even though we just redecorated our bedroom, it didn’t take long for the photo frames to need cleaning. 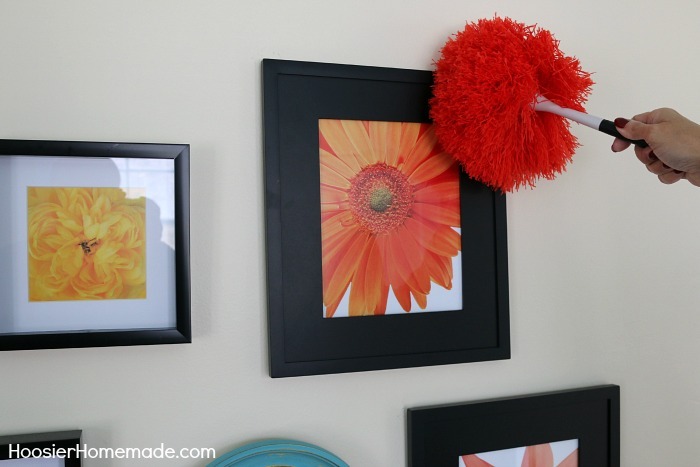 The OXO Microfiber Delicate Duster is great for dusting picture frames, knick-knacks and other delicate items. It has a non-slip soft grip and is machine washable. Working on my computer every day for hours and hours, it gets messy. And yes I eat at my desk, I know I shouldn’t, but I’m a busy girl. 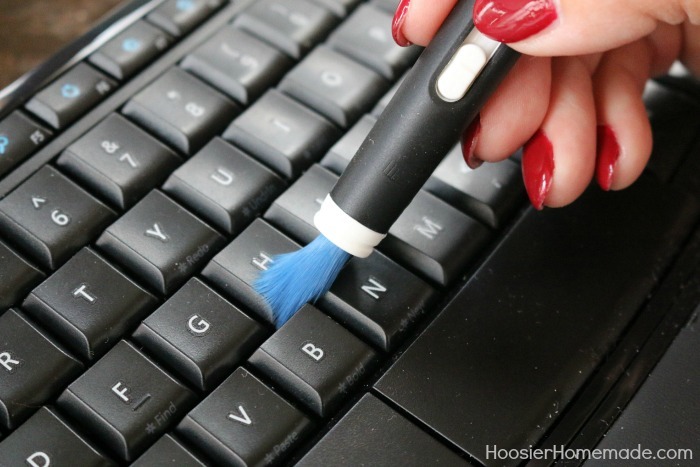 The OXO Electronics Cleaning Brush is perfect for keyboards, cameras, phones, watches, any small crack that you need to clean. The soft bristles gently sweep away dust and on the other end is a slim silicone wiper that grabs dirt from the smallest, hard to reach places. And for $5, this is must have tool for everyone! Since I spend a lot of time in my kitchen, my utensils get used a lot. 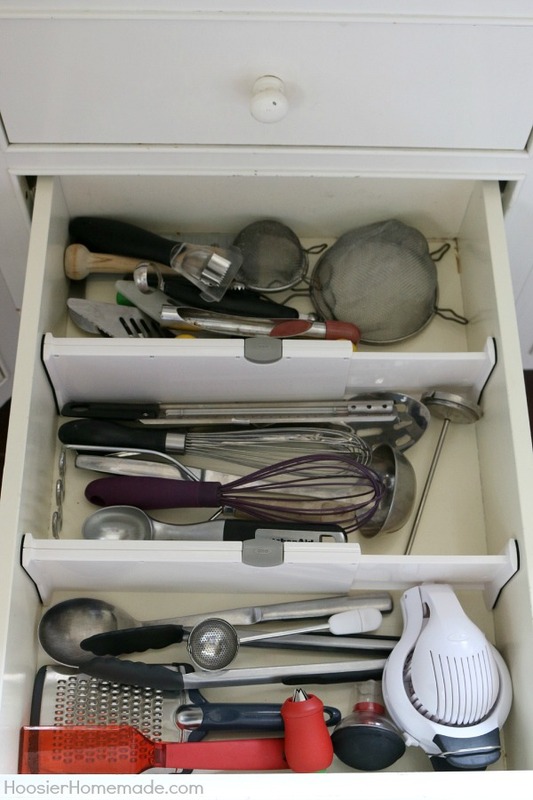 Frankly, my utensil drawers have gotten out of control. 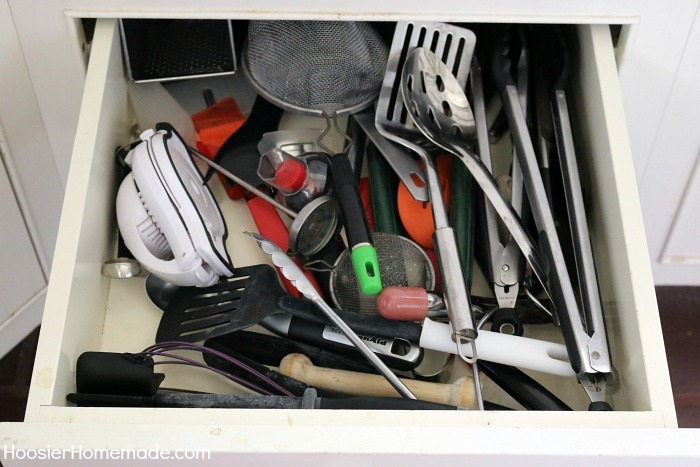 The OXO Expandable Drawer Divider to the rescue! Perfect for organizing any drawer, the arm easily expands to fit a wide range of drawers. Simply press the button to create tension for a secure fit. The foam pads on the ends protect and grip the inside of the drawer, they are durable and won’t shift or bend. We tackled the utensil drawer by first removing all of the tools. Then I put them into 4 piles – keep, look at again, store away for the boys and trash. The first pile were tools that I knew I wanted to keep, of course the Strawberry Huller I mentioned earlier, the OXO egg slicer, the cupcake corer and more. Then I put the tools in a box that I wanted to keep for the boys when they have their own place. And of course, threw out tools that were broken. The last pile was my “look at again” pile. Did I really need to have 4 sets of tongs? Was there a reason I had 2 different sifters? Then I got rid of more utensils, and now I have a nice clean utensil drawer and it’s easy to find what I need. Oh and one more good reason to have utensils organized. See that meat thermometer? The sharp end was poking up when I first opened the drawer. If I hadn’t been paying attention and just reached into the drawer, I could have been poked. Are you ready to tackle your home?